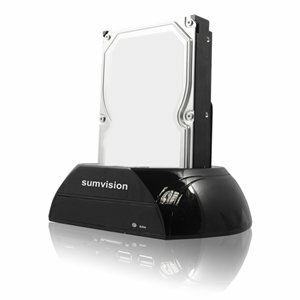 With the Sumvision ICO SV552 ESATA Plus 2.5 Inch 3.5 Inch SATA Docking Station with Card Reader lets you use your SATA hard drives without having to buy a caddie for each one. Simply slot in either a 2.5" or 3.5" SATA hard drive and use it as a normal external drive. The device will show as a removeable drive in My Computer, allowing you to access, drag and drop files at your leisure. When you are finished, remove the hard drive and you can use another right away. The docking station also features built in card reader making this your one top media hub! For SAME DAY DISPATCH please place all orders before 3PM.